QueryStore feature in SQL Server 2016 is very helpful for any SQL Server resource to identify and troubleshoot the performance issues in SQL Server. This feature enables to store the query information along with query plan. The query execution statistics also collected associated with each query. Why do we need QueryStore feature or How does it help? Yes, we do have an option to analyse the query execution before Querystore using Cachedplan in earlier versions. However, the downside is Cached plan will be saved in memory and it will not be available once SQL Server has been restarted. This was always a challenge for DBA/performance engineer to identify issues with Query execution. QueryStore actually stores plan and other information in memory initially and as per the configuration it writes to disk.So, even SQL Server gets restarted, the information can be collected from the disk(those written in the disk). Let us see the plan of the query to understand in detail. What do we need to configure for Querystore? Operation Mode(Actual) – This is disabled by default to represent the Actual mode of Operation. Operation Mode(Requested) – This is to configure the mode of Operations. Data Flush Interval(Minutes) – This is to specify how frequent the data needs to write to Disk from memory. As higher the number, there is a risk of losing data(if any restart occurs between the specified vaue), lower the number there is an overhead of writing the information to disk. Default value is 15 minutes. Statistics Collection Interval – This is to record the information about execution statistics of queries being executed.Default is 1 hour. Max ize(MB) – The maximum size in MB that can be allocated to store the information. Default value is 100. Once the size reaches out the specified value, it will NEVER write further, only read is available. 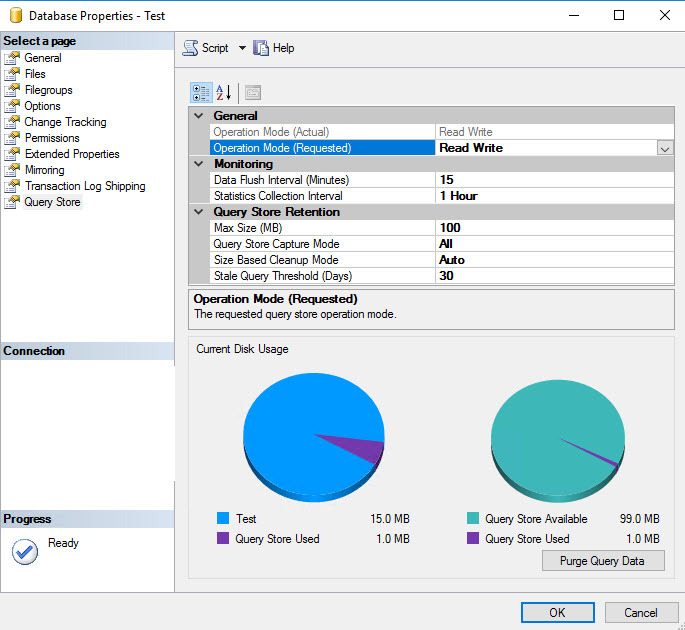 Query Store Capture Mode – This is to determine what needs to be collected. Auto – Collects only the relevant queries, filters out the insignificant queries.However, there is no external influence on identifying the significance, its completely an internal process. Size Based Cleanup Mode – Auto – (Default if QueryStore is enabled. )This will cleanup old and least expensive queries from QueryStore as per the size specified. Stale Query Threshold(Days) – Number days the Query information stays for. By enabling the QueryStore, the default value sets as 30 days. Where do we get the information from QueryStore? Microsoft has provided a good number of DMVs to get the QueryStore information. The above DMVs provide enough information about Query execution statistics for you to troubleshoot your query performances. How to purge the querystore information?